KATO Tsubusa | Celadon Square Bowl — Dai Ichi Arts, Ltd.
Porcelain is invariably associated with the Chinese porcelain aesthetic: refined, delicate, serene, elegant, tranquil, in short, perfect. 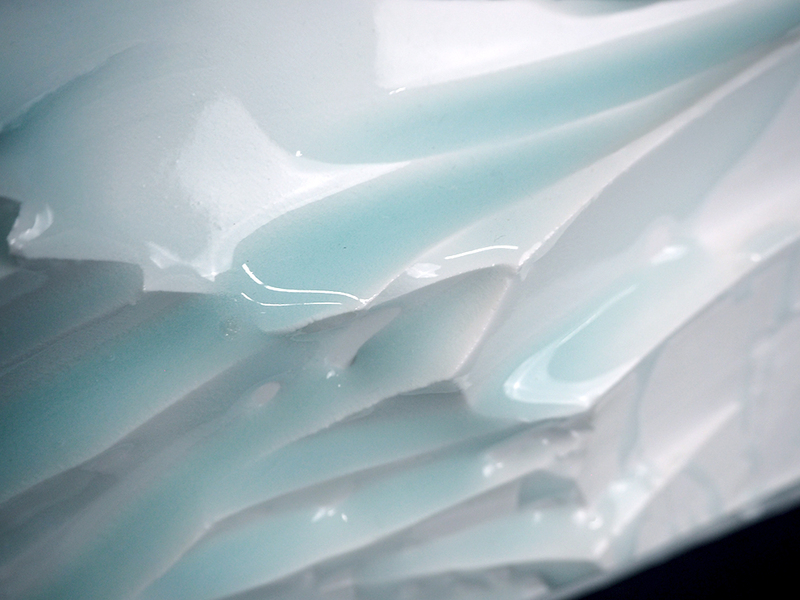 The work of Kato Tsubusa in white porcelain with subtle pale blue celadon glazing, is no less beautiful than traditional porcelain, but much different. Kato’s porcelain sculpture manifests motion, not serenity, adventurous form, not luxurious elegance; it is dramatically sweeping, not refined stillness. A few of his pieces can be put to actual use - - provided one is willing to risk the razor sharp edges and daunting fragility of his "vases" and "platters." Starting from age 21, he has worked exclusively with white porcelain clay. Kato accepts the challenge of working with clay in its most difficult, fragile form: long strips of clay supported at only one end. At the apex of the tall triangular body, one long strip reaches skyward and another, almost a continuation, points to the ground, like the outstretched arms of a ballerina. A better comparison is to the art of calligraphy. The long, vibrant strips of clay resemble calligraphic strokes. Energy. Pure energy in clay embodying dashing calligraphy. Kato’s homage to Japanese calligraphy.